Today we are reviewing a case study from the S.A.R broadcast club who is having a profound impact on the school’s sports teams. The broadcast club now live streams as many sporting events as they can using a PTZOptics NDI camera located in their main gymnasium. The camera allows the broadcast club remotely control the pan, tilt and zoom locations using a PTZOptics IP joystick. Using the NewTek NDI, the club is able to manage everything remotely, and the Athletics Department could not be happier. I had the chance to interview Joseph DaCorta who is the Athletics Director at the S.A.R high school, who shared with me some insights about how both coaches and students are using the live streamed video recordings of their games. DaCorta asked me to sit down with Valerie Gryzlo who is the S.A.R high school’s head coach for multiple sports teams to learn more about how coaches are reviewing the recorded video footage to improve athlete performance and gain a competitive edge against their competitors in the league. Let’s take a look at how the broadcast club is helping their athletics department provide enhanced training opportunities for the athletes and gain a competitive advantage by reviewing past recordings to analyze their opponents before big games when a recording is available. I had the chance to interview Joseph DaCorta who is the Athletics Director at the S.A.R high school, who shared with me some insights about how both coaches and students are using the live streamed video recordings of their games. “There are plenty of times that a coach will take the teams into a classroom settings to through up live footage from the games, rewind it back and say hey guys check out the type of defense that they are playing… any particular sporting event that our teams are playing, the can recall video from the live stream and dissect the film and really use it to our advantage” DaCorta told me. See how this schools athletics department is using the live streamed video recordings to be more competitive and work on athlete skill improvement here. See the PTZOptics Sports Case Study Portfolio here. Special review of custom PC computer builds for live streaming sports here. Wireless live streaming sports setup review with PrepSpin here. Using PTZOptics cameras outdoors, popular for live streaming sports here. The flipped classroom is such an amazing idea, honestly… I’m jealous. Finally, some really smart people got together to prove that the concept of “Homework” is actually counter-intuitive to learning. In this blog post, we will discuss how the Keck School of Medicine at the University of Southern California is “flipping the classroom one video at a time.” But what is the flipped classroom? And how does this concept help students learn by bringing the hands-on “homework” classwork back into the classroom? The “Flipped Classroom” is a proven form of blended learning which flips the traditional educational process. Instead of sending students home with homework each week, teachers bring engagement into the classroom by doing the homework in class. In this way, students can learn at their own pace, at home, using online learning management and multimedia tools. At the University of Southern California, the faculty and staff have placed high importance on the production quality for the lectures they produce to build out their online course resources. Outside of the studio, Gary often works with teachers in classroom and auditorium environments. Using the remotely controllable PTZOptics NDI cameras, Gary has developed a functional plan to extend the schools capabilities. Working with the schools information technology department Gary has secured a static IP address on the university’s extensive network for the PTZOptics camera. This allows Gary to easily send out the camera to any location on the schools network and record a lecture. Gary pairs the PTZOptics camera with a small audio mixer used to capture audio. Sometimes the audio mixer features a directional microphone and other times Gary uses a wireless lapel. Either way, Gary is able to record broadcast quality 1080p video connecting the PTZOptics cameras using NDI with Wirecast. Inside Wirecast, Gary is able monitor the presentation and setup multiple camera presets. Gary has also used the NDI scan converter to capture video from PowerPoint presentations to be included in each recorded lecture. Wirecast provides the video mixing capabilities to setup picture and picture layouts. Paul Richards: Hi everybody. Paul Richards here with PTZOptics. I’m here with Gary San Angel, from the University of Southern California at the Keck Medicine School and Gary has been using our PTZOptics NDI camera models in a very interesting way and I wanted to ask you a little bit about that. Gary San Angel: Sure. So what’s really exciting about the PTZOptics NDI camera is it’s really kind of revolutionizing the idea of doing lecture capture. In traditional lecture capture, you have an AV person who goes out on site, who records or you have to like really spend hundreds and thousands of dollars to upgrade a room. Now with the PTZOptics NDI camera, we can literally install this or put it on a tripod, have a little mixer. I have some pictures where we were actually doing a test a few weeks ago and literally controlled this camera like miles away, as long as you’re set on the network. So this camera was in another auditorium and in our master control, I was able to feed this camera and record both the content and the video using NDI, which is so awesome. I mean I love it. It’s great. Paul Richards: So you’re using Wirecast, I understand, which is a very popular video production software. It also allows you to live stream and record. In fact we’re recording right now on Wirecast with these two cameras and I wanted to ask you a little bit about the networking side of things because I know the University of Southern California certainly has quite a large network. Paul Richards: And we had to work together a little bit to make sure that all the IT requirements worked for NDI and you were able to actually get an NDI stream work for four days continuously. Gary San Angel: Yes. So one of the key things, especially in a network, as security-driven as USC is, we really worked with our IT to make sure A, we had a static IP. So you got to have a static IP to make this work, so it doesn’t fall off the network. Two, through the help of PTZOptics and also through the new tech Access Manager, we were able to get this working for four days straight. Gary San Angel: So that’s really exciting and really good news for us because it was an initial thought in my mind. This should work, you know. But then when you put it out in the field, we saw it does work, you know. So that’s super exciting to us and our IT is beginning to understand a little bit more about network protocols for NDI. So there needs to be some homework given to them around it for – and some buy-in and understanding. So once we got that, it all squared away. We really made some progress. Paul Richards: … over your network and of course the due diligence. We worked with the Information Technology Department and made sure that they were on board with the NDI HX, the high-efficiency video that will be going over the local area network, which is obviously very important and can be – you know, it has to go through all the right procedures at a university level like this. So let’s talk about what you’re actually doing with the video content that you’re creating here in the studio and that you’re doing around the campus. Gary San Angel: So one of the things that we do every month is creating a development series for the SC CTSI which is the Southern California Clinical and Translational Science Institute. So we do a number of career development recordings and one of the things that I’ve been testing is to see how we can use NDI as a means of elevating our ability to have a lot more mobility, because of this robotic camera, in terms of shots, as well as the use of NDI being able to control that from miles and miles away is unbelievable. I mean it’s crazy to be able to think that you can have this kind of control and quality within this small camera. So I’m really excited about it. I’m excited about the potential to really save hundreds of dollars in resources, in funds, to build out studios or even spaces with just a minimal sort of run and gun PTZOptics camera, a small mic mixer, which is what we attach to it and a little shotgun mic. You can obviously have a lav connected to a speaker and really do some amazing lecture capture recordings with this little camera. Paul Richards: Yeah, and it must be really convenient for you because now you had your studio here at the Keck – I guess this is Building 2100. But this is a massive campus. So to be able to send a camera out or have one in place already and not have to spend maybe – it could take you an hour to get from one side of this campus to the other. Gary San Angel: Yes, absolutely and with LA traffic, yes. You add another helper [0:05:38] [Phonetic] onto that. Paul Richards: So it’s really nice that you can leverage that network that’s there. Paul Richards: And get very low latency, high quality recordings from your office. So you can be more productive. I mean – and have a great connection. So I think that’s awesome. Thanks for taking the time to watch this video. This has been Gary San Angel from the University of Southern California’s Keck School of Medicine here using the NDI camera showing that at a higher education level, with a little support from IT, you can really do a lot. Gary San Angel: Absolutely. And with the new technologies that we have, we’re just super excited about NDI and working with the PTZOptics camera. This is such great stuff. So get one. Seriously it’s amazing. Paul Richards: Thanks for taking the time to watch this video, everybody. Click that “Subscribe” button if you like to see more interviews like this and share this with somebody in your school or higher education institution that should learn more. Take care everybody. Bye. I wanted to build a Green Screen studio; green screens bring out the kid in you, you know? In Disneyland or any place where you have a Green screen, you just become like a child. That’s the beauty of it and one of the reasons why I gravitated to it. I get these researchers and all these super serious doctors to become kids again and to smile and enjoy the process of doing these recordings. By those means, we’re able to get content that’s natural, and users can really connect to their audience. Sure. Right now we are doing some testing with PTZOptics to switch over our studio to all NDI cameras. I have been researching and working with NewTek about NDI and its function in academia. One of the reasons why NDI is very important is because it allows for the ability to use your network infrastructure as your cable runs. In traditional video production, you have incredibly long physical cables (SDI cable) that connect your cameras. So we’re using the robust network of our USC infrastructure which has a lot of bandwidth. What I think is very innovative about NDI is that it’s kind of a two-way street where you can send and receive signals. You can send something from the camera to Wirecast, which is what we use for video mixing and doing the recordings. What that allows us to do is, for example, is if you’re in a classroom that has internet you can connect a network camera and we, in our master control, can see the camera on the network and record your class. That is a considerable saving in infrastructure. To build out all those audio-visual capabilities could be like eighty to a hundred thousand dollars whereas here, we put PTZOptics cameras with a small mixer and a microphone in a classroom and can control the camera, and record the class remotely. We can capture the screen on the presenter laptop play that right back into our master control as well. Recording your content and recording from the camera anywhere in that network is revolutionary. Currently, we have also Panasonic GH5 cameras as well. So the PTZOptics cameras will allow for that flexibility with our other stationary cameras and give us much more ability to get great angles closeups, and more. I mean it’s super cool to be able to operate that camera as just one person, so you don’t have to hire two or three camera operators. To me, it’s a game changer all the way. People have the question of latency, and I have to say that the new NDI-HX protocol is more efficient with bandwidth and works phenomenally well. Visually I do not see latency, maybe if somebody were to do a scientific test, it could be detected, but quite honestly it is good enough for me to say this is ready to go. You can do this without even buying a camera. Go to Newtek’s website, and they have all the tools available for free. I’ve talked to the marketing guys from Newtek, and they are astonished that the CEO is giving this out to the world for free! So you can get one of the best video converter tools for free, and you can install it on any laptop. That way you can test out NDI without the risk. When you are ready to take the next step, I suggest going with PTZOptics cameras because its the most inexpensive solution and the tech support is fantastic. To me the tech support is critical. The PTZOptics team just finished testing an outdoor camera enclosure for our ZCam family of products. The Evertech Security Surveillance Outdoor Camera Housing with Bracket and Built in Heater-Blower is Weatherproof and it is made out of Heavy Duty Aluminum. Note: If you are looking for an outdoor enclosure for your PTZ camera model the Dotworkz D3-CD-HB is a great choice. This outdoor camera housing unit is a perfect fit for our Variable Lens, 12X and 20X ZCam camera models. This outdoor camera enclosure includes a Heater/Blower system to keep the glass and camera lens from fogging due to changing temperatures. When you select an outdoor enclosure it’s important to carefully consider the electrical requirements for your outdoor installation. LinkedIn has recently announced a new feature for the business-focused social media platform…. That’s right Live Streaming. As of early February 2019, LinkedIn will be rolling out Live Streaming as an invite-only BETA feature for USA users. If you haven’t already been invited to be part of the LinkedIn Live roll for the invite-only beta phase, you will be able to apply for access to the service in the coming months. So, how are businesses, brands, and individuals going to start using LinkedIn Live? Well, LinkedIn has mentioned that they hope users will broadcast content that falls in line with the business-related content that is already popular on the platform. This could include live conferences, product announcements, Q&A sessions, and other office hours events. On a scale from Facebook Selfie Streams to LinkedIn Live content, you can bet that LinkedIn live streams will make a name for itself by catering toward business-related interests. So we would love to share some of the ways our business is preparing to use LinkedIn Live. First of all, we plan to create specific content for LinkedIn. It would be a mistake to live stream the same content you are planning for YouTube and Facebook to LinkedIn. As social media platforms release new features like this there are often many misconceptions with about the proper use. One of the best tips we have learned about live streaming over the past 5 years is the power of creating platform-specific content. Everyone knows that LinkedIn members moderate the content they find on their newsfeed. If your content is not business related you are sure to hear about it in the comments. Listen to the feedback you get in your contents comments and always strive to improve your approach based on user feedback. LinkedIn is known as an online resume for business professionals and the most likely viewers of your LinkedIn live streams will be your professional connections. This network includes your co-workers, people you used to work with and prospective clients. With this in mind, your LinkedIn live streams should remain professional and business oriented. As you can see at our office, we have built a professional live streaming studio that allows us to create presentations in a professional space. If you are used to live streaming on YouTube and Facebook, you are going to have a huge leg up on your competition when it comes to preparing to go live. If you are waiting for access to LinkedIn Live, consider using Facebook and YouTube as a practice space. While you may have had success with a laid-back, impromptu live stream on traditional social media platforms, you will want to put your best foot forward on a platform like LinkedIn Live. Think about preparing for a LinkedIn live session the same way that you would for a professional interview. LinkedIn is a place where users highly regard their profile accuracy and business reputation. Unlike, YouTube and Facebook which suffers from large amounts of fake accounts and sometimes unaccountable activity, LinkedIn’s community and established culture will lead to a higher level of quality and accountability. With this in mind, you want to make sure that your content is highly produced and effective in telling your story in a professional way. Remember, time is money and the users on LinkedIn are all aware of that as business professionals. Short videos are already performing extremely well on the LinkedIn platform. Facebook has publicly stated that viewers on the platform spend on average up to 3 times more time watching live content versus pre-recorded on-demand videos. With this in mind, consider how you can incorporate live viewer engagement on your LinkedIn live streams. Do not make the mistake of ignoring your live audience. Consider addressing live comments and recognizing your audience by name. Remember that the people commenting on your LinkedIn live stream are part of your business network and may be important partners and/or prospects for your business. When was the last time that you updated your LinkedIn profile page? When you go live on the platform, consider keeping your branding consistent. LinkedIn Live streaming will likely be available for both individuals and business pages. You should keep your business page, updated and consistent with your companies branding. Your live streams should be no different. Consider your ability to share your live streams with relevant business pages, groups, and like-minded individuals. It’s time to take LinkedIn off the back burner and schedule a meeting with your social media team to think about how you can take full advantage of the platform. So where do you go from here? If you are thinking about building a live streaming studio in your office, download our free guide here. 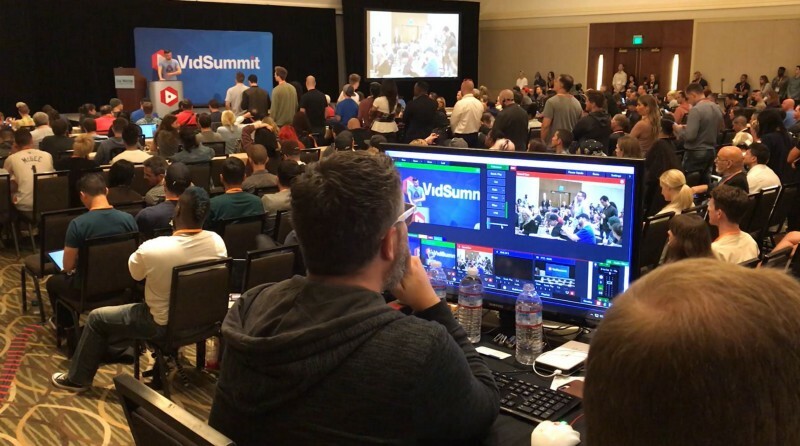 If you are considering live streaming a major conference or product release we have a guide on that as well Conference Streaming. Finally, if you want to learn about our strategy for live streaming you can download our Ultimate Guide to Live Streaming for free at the link below.